Unlike usual editions of Furrow Books, each Founding Supporter notebook is packaged and offered individually instead within a pack. Only 1,500 pocket-size and 1,500 large-size notebooks were created and each one is carefully numbered by hand. The dark green covers are created with offset printing on a fiberous white coverstock and are slapped with a vibrant green logo and text snippet on the back. The interior paper is made of the 100% PCW recycled and acid free 60#T paper and is compatible with a wide variety of writing instruments. 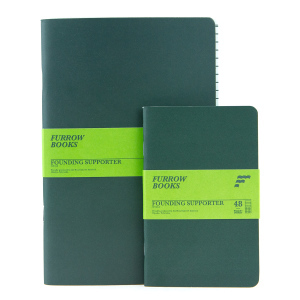 Slipped inside of each of these Furrow Books is a white insert that is printed with the same dark green color as the cover to provide you with the options of 1/4″ lined or 3/16″ graph ruling at any point within your notebook. Each Furrow Book is then saddlestiched with a few durable staples and given a nice 1/4″ rounding to the outside corners.